Colin Meloy plays with The Decemberists during the first night of Travelers’ Rest. Travelers’ Rest may be the best festival for any indie music rock fan – period. First off, it’s an artist-curated event with The Decemberists at the helm. Who knows how to select a festival lineup better than the artists themselves? No one, I say. Next, it’s the perfect overall length and amount of music. With two days and start and end times of 3:30 p.m. and 11:15 p.m. each day, respectively, you get to see nine acts and not have to stay up all night. At times, the three- and four-day festivals are fun, but a bit long in the tooth on hot summer days. As a bonus, you also get to see ALL the acts if you want. No overlapping artists and schedule conflicts. A music festival goer’s dream! Thirdly, the festival location and size. Missoula, Mont., is idyllic with its big blue sky and majestic mountains in the distance, yet remote enough to not draw overwhelming crowds compared to festivals in large cities, such as Chicago, New York City, Los Angeles and Detroit. The Big Sky Brewing Company Amphitheater has the right-size feel for an outdoor venue that holds up to 5,000 people. Finally, who wouldn’t want to spend two musically, fun-filled days with The Decemberists and their friends? For me, it’s a bounty of exquisite musicianship and artistry. That’s exactly, what it felt like yesterday during the first day of Travelers’ Rest. 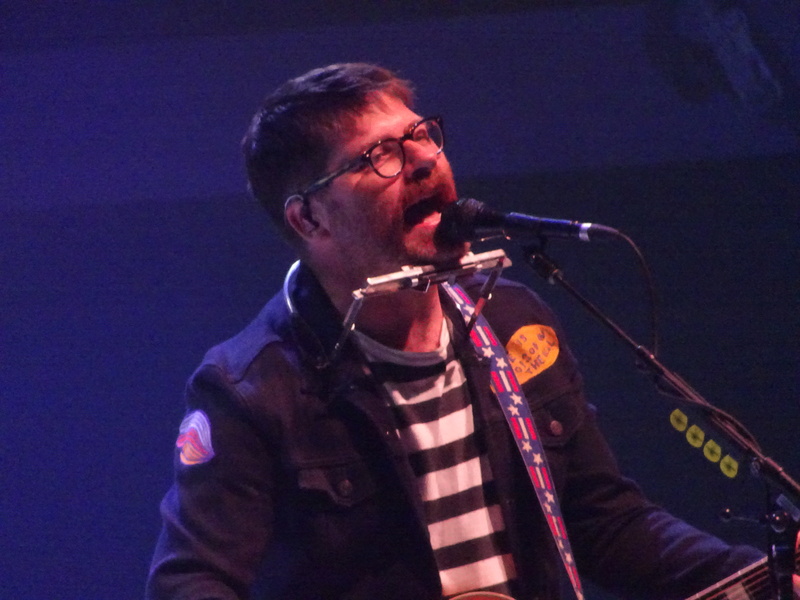 Last night, The Decemberists headlined the first night of their festival and played a cornucopia of new songs and past treasures from their eight-album catalog. 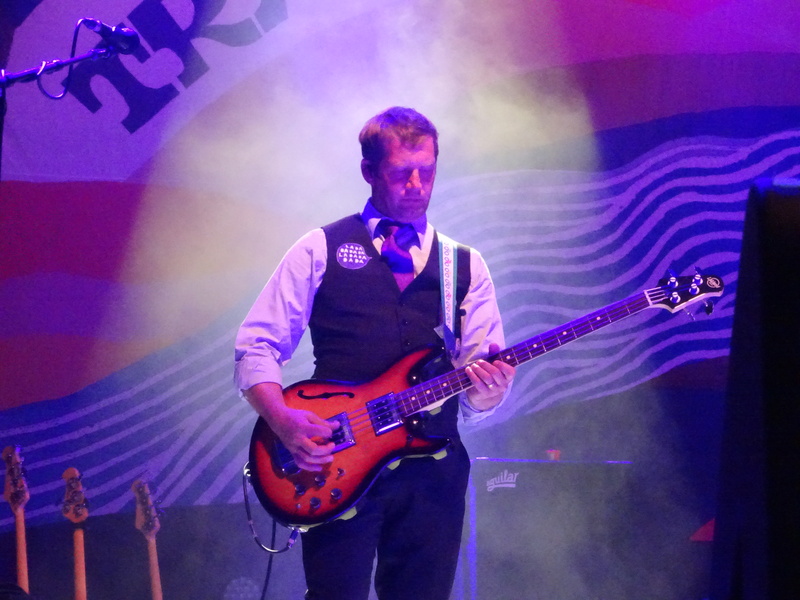 The hour- and 45-minute set included several tracks from “I’ll Be Your Girl,” the band’s latest album. My favorites are the synth-heavy “Once in My Life” and “Severed” and the folk-flavored “Cutting Stone,” “Sucker’s Prayer” and “We All Die Young,” which featured I’m With Her’s Sarah Jarosz dressed in her yellow Ghostbusters-inspired jumpsuit on cowbell. While I’m a Jarosz fan, I wish my friend Rachel had provided cowbell support like she did for the Ann Arbor, Mich., show back in May. Hopefully, Rachel will lend her skills once again in Indianapolis in October. Cowbell aside, The Decemberists’ frontman Colin Meloy thanked fans for making the trek to Missoula to be part of the second annual Travelers’ Rest. He also peppered the set with stories about losing and returning a friend’s red Schwinn bike, writing a Decemberist-y expletive folk tune called “Ben Franklin’s Song” for Lin-Manuel Miranda’s monthly “Hamildrops” series and the band’s longtime friendship with Pacific Northwest pals Death Cab for Cutie. “So by all means sing them with all of your heart. Even if you don’t really know the words, you can make them up as I often do,” Meloy joked. Before The Decemberists took the stage, Death Cab for Cutie gave a one-hour explosive performance with fan favorites, including “I Will Possess Your Heart,” “Crooked Teeth,” “Soul Meets Body” and “I Will Follow You into the Dark.” They also played two new tracks – “Gold Rush” and “Autumn Love” – from their forthcoming album, “Thank You for Today,” due out Aug. 17. 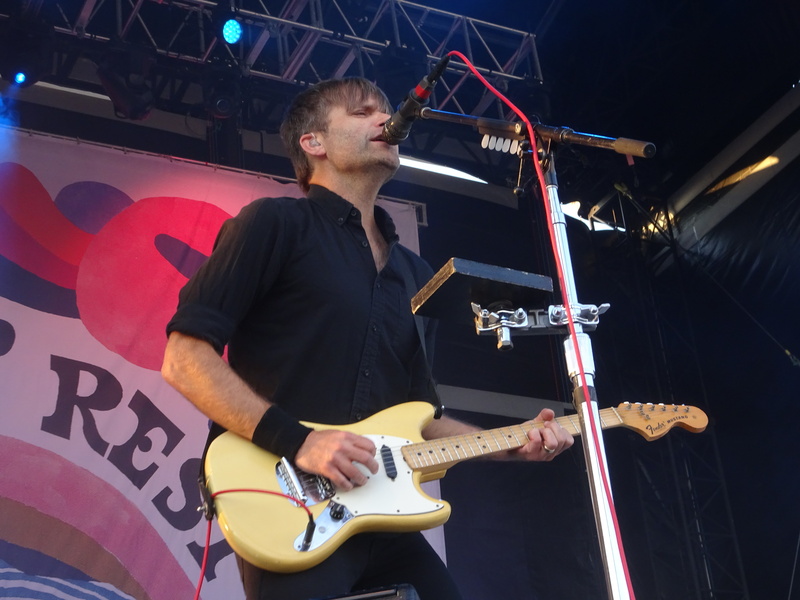 In between songs, Death Cab for Cutie vocalist and guitarist Ben Gibbard comically set the record straight about the band’s involvement with Travelers’ Rest. 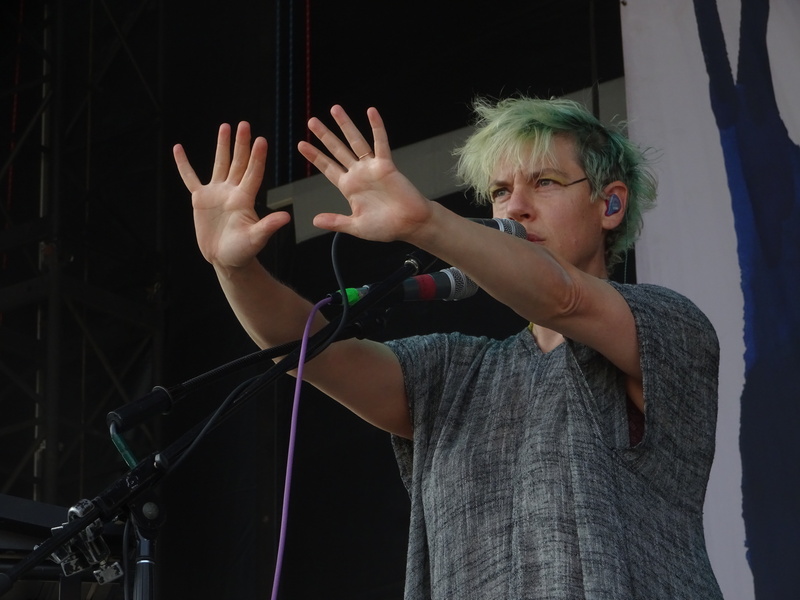 The crowd dug Tune-Yards for their entire set and so did I. It was the first time I’ve properly seen them. In the past, I’ve only caught snippets of them at other festivals. Lucy Dacus – Hailing from Richmond, Va., this indie singer-songwriter performed songs from 2016’s “No Burden” and her latest release, “Historian.” I’ve seen Dacus twice before, once opening for The Decemberists and another time with Car Seat Headrest. It was so much fun to hear “Addictions” and “Strange Torpedo” live. I’m With Her – Comprised of folk trio Sarah Jarosz, Sara Watkins and Aoife O’Donovan, I’m With Her performed songs from their debut album, “See You Around.” This folk supergroup is a real treat for fans of Nickel Creek, Jarosz’s work as a solo artist and O’Donovan’s involvement with Crooked Still. Their yellow Ghostbusters-inspired jumpsuits also served as the best stage outfits at the festival. Rotgut Whines – This Missoula-based duo is making lots of noise on the local and national music scene. Their gritty, rock sound includes hints of Kings of Leon and The Black Keys, which is quite the powerful combination of influences. Kudos to The Decemberists for using Travelers’ Rest as a platform for exposing fans to one of Missoula’s burgeoning acts. Lenore – Centered on the beautiful harmonies of Rebecca Marie Miller and Joy Pearson, Lenore is a folk-rock quartet from Portland, Ore. While reminiscent of Sweden’s First Aid Kit, the four-piece delivers a delicate, emotional folk sound that will hopefully drift outside of the Pacific Northwest to other audiences. What a joy (pun, intended) to see their set! Waxahatchee – This wasn’t the first time I’ve seen Waxahatchee, or Katie Crutchfield. My husband and I are big fans of her gorgeous songwriting and relished the chance to see her perform solo at Travelers’ Rest. She played tracks from her latest release, “Out in the Storm,” and delivered a beautiful cover of Lucinda Williams’ “Drunken Angel.” During her set, Crutchfield announced she’s getting ready to release a new EP. Good news for Waxahatchee fans. Matt The Electrician – Known as Matt Sever, this Austin, Texas roots rocker gave a raw performance mixed with catchy neo folk and quirky observations. His melodic voice reminded me a younger, more experienced of Paul Simon combined with Tom Waits. Sever has released a dozen albums through 2017. That was quite a memorable first day for Travelers’ Rest. Here’s to day two with Jeff Tweedy, Whitney, Mavis Staples, Parquet Courts and other cool acts. Oh, and fans get to hear The Decemberists play their 2006 masterpiece, “The Crane Wife” in its entirety tonight. I’m already geeked about hearing “The Island” tonight! Travelers’ Rest — The Decemberists Host 2-Day Music Festival in Missoula, Mont. Crutchfield lives in Philly, unless she moved recently. I live near Philly but have never seen her. One of these days . . .
Great recap of the fest. Take care. Thanks! Hopefully, one day you will see her.